Dollars aren’t black and white. They’re green. Every dollar’s green. It’s very easy to make an average biopic. You have a life story that’s interesting enough on paper and simply join-the-dots between significant events, or amalgamate a few less compelling ones. Apply a liberal dosing of old-age make-up for the final chapters and presto; a perfectly respectable and utterly undemanding true-life tale. 42 at least avoids the least creative impulse of such fare, that of compressing a life time into 2 hours come hell or high water. Instead it adopts the more manageable Lincoln tactic of focussing on several singular years in the life of its main player. This main player is not Douglas Adams, and his quest for the answer to the meaning of life, the universe, and everything. Rather, it concerns baseball player Jackie Robinson who, as an African-American signed to the Brooklyn Dodgers in the mid-1940s, has the reputation for breaking the colour barrier in that sport. I’m not a fan of rounders, I mean baseball, but I do generally enjoy baseball-themed movies. The compelling nature of a sport, or otherwise, seems to have little relevance to the quality of movies based on that discipline. This is why there are no good football (or soccer) pictures. Baseball at the movies tends to embrace the aspirational and mythic, at times teetering towards the sentimentalisation of all things Americana, but Field of Dreams is guilty of the large-hearted sentimentalising that often comes attached and still manages to be a great movie (The Natural, less so). 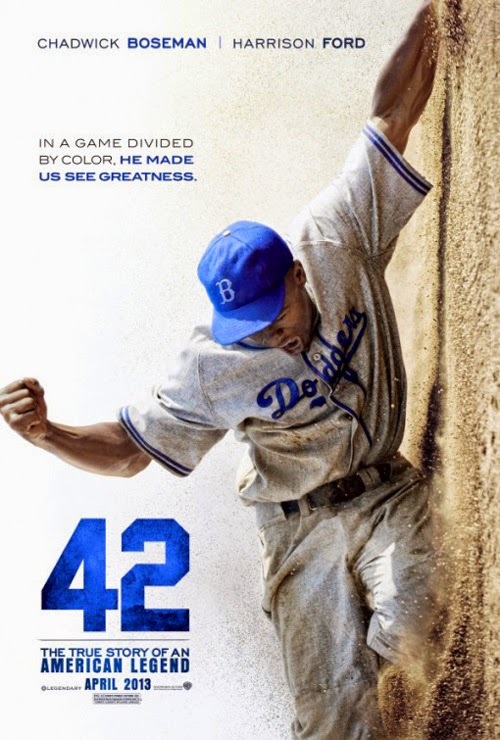 Aside from drama of the playing field, 42 knows full well it has one of the key ingredients of audience-friendly movie plotting on side; an against-the-odds fight against prejudice. It can’t really fail, but it’s also the case that the movie is unable to rise beyond the painfully self-conscious straightjacket of the importance of, and responsibility to, the events and messages it depicts. 42 is over-reverent and so, for all the quality of the performances, it remains beholden rather than taking on a life of its own. There is also an inherent problem at the core of the picture. We are told from the outset that Robinson (Chadwick Boseman) will have to be a living embodiment of “turning the other cheek” if he is to really bust through the wall of prejudice and segregation; if he responds to taunts and abuse it will only be his reaction that is remembered and reported, not that of the abuser. But how do you depict someone who has to keep a lid on it at all times? We learn that Robinson was strong-willed, and not the sort to rein in his emotions, but other than repeated instances of him suffering both verbal and physical assault on the field, all essayed with furrowed accomplishment by Boseman (who has just added another biography to his collection, in Get On Up), what insight are we granted into the man? Off the field his domestic life with adoring wife Rachel (Nicole Beharie) is a complete snooze. Essentially, the man has no identity beyond the racism he must combat. This isn’t Boseman’s fault at all, it’s a consequence of the way writer-director Brian Helgeland positions the story. While it isn’t unusual to have supporting characters steal a movie, it’s particularly stark when Jackie is the silent cypher under pressure. The movie essentially depicts him as he had to portray himself, and there is little insight beyond his conscious decision to do so. But even that is taken away from him since the main “hero” of the piece is turns out to be Harrison Ford’s eccentric and gruff money machine baseball lover Branch Rickey, Dodgers’ executive and president. Rickey portrays himself as motivated by greenbacks, but we eventually learn there is good old Christian idealism behind his actions. He is the great white mentor, guiding Jackie through his trials. This is most laughably transparent in a highly convenient appearance following a particularly unbearable tirade of abuse from Philadelphia Phillies manager Ben Chapman (Alan Tudyk, decidedly not putting on his endearing face). Jackie returns to the dugout and smashes up his bat, silhouetted against the doorway as he does so. And then the angelic Rickey dodders in past the camera and offers sage advice, even with an added shoulder to cry on. It’s a hopelessly artificial moment, the stuff this sort of only-in-Hollywood aspirational fare just can’t resist. You’d hope for something a bit better from Helgeland. This shorthand is problematic at other times; Ostermueller, the bowler who winged Jackie in an earlier game, is set up as arch-nemesis, yet they have shared just one scene together. Elsewhere, Rickey stands firm against pressures and threats, espousing good Methodist thinking and sound free market values. There’s much talk of God, as there often is in these nostalgia-hued period pieces (it’s a consistent feature of movies that present a past of prejudice and inequality that they also carry a wistful beauty courtesy of diligent costuming, art direction and cinematography); it’s the cake and eat it approach of there being better times in the past where the same core beliefs can be linked both to all that is right and all that is wrong with society (in other words, as long as you aren’t a racist Christian, you’ll probably be on board with the movie; it even gets the boot in at adulterers). I wouldn’t go as far to say that a prosthetics-enhanced Ford is unrecognisable as Rickey, but he immerses himself in the part to an extent he has done with no role since the 1980s. He’s having immense fun and, if his standard constipated expression sometimes leaks through, it’s the most engaging, animated performance he’s delivered in a quarter of a century. It’s also a dream role; didactic and verbose yet with a heart of gold. Harrison must have wondered that no one deemed him fit for an Oscar nomination. It says something about the part and the unevenness of the screenplay that Rickey far eclipses the subject of the movie. Yes, this is all about a white world but that makes it all the more vital that the subjectivity doesn’t lie with the one espousing the values the white audience should hold. The director, who begins with a Rickey speech and effectively ends with him looking proudly over an empty stadium after Robinson has got the Dodgers through to the World Series, takes the easier, more attractive route; the grandstanding showman proves irresistible, and the result is that, while the drama of Jackie’s encounters on the pitch is strongly defined, much of the actual discussion and conversation is reduce to pat homilies and trite learning about equality and what it means to be subjected to intolerance (one of the few really striking scenes has a son in the crowd striking up an racist chant at Jackie, mimicking his father, only to take stock when his hero, Lucas Black’s Pee Wee Reese, puts his arm round Robinson in a gesture of solidarity). Helegland the writer probably has a better rep than he currently deserves; much of that comes from his Oscar success with L.A. Confidential and the subsequent Point Blank remake messed with by meticulous Mel, Payback. He made a subsequent writer-director splash with medieval to rock music A Knights Tale, but he’s done little to convince since. As a director he doesn’t seem to be as natural as some of his writer peers (Davids Twohy and Koepp, Scott Frank, Christopher McQuarrie), and one can’t help thinking that some of the vitality that a contemporary soundtrack imbued on Knights Tale wouldn’t have gone amiss here. Such as the Jay-Z that accompanied 42’s trailer. The last thing you want for a movie, unless it is pure unadulterated Oscar bait, is for it to be talked about in respectful, hushed tones. It means no one really got excited about and this picture, from the syrupy John Williams score (courtesy of Mark Isham) down, lacks the spark to sound off passionately, to get angry and provoke. It’s comfortable with itself, a job well down in playing the middle ground. And so it joins the ranks of the majority of respectable, unremarkable biopics.